Raymond Blanc is probably my all-time favourite TV chef. Happily, I’m also a big fan of his restaurant chain, Brasserie Blanc (I’d have been hugely disappointed had it not been good), and whenever Mr W and I go to Bristol, we try to incorporate a visit to Brasserie Blanc in the Quakers Friars area of Cabot Circus. 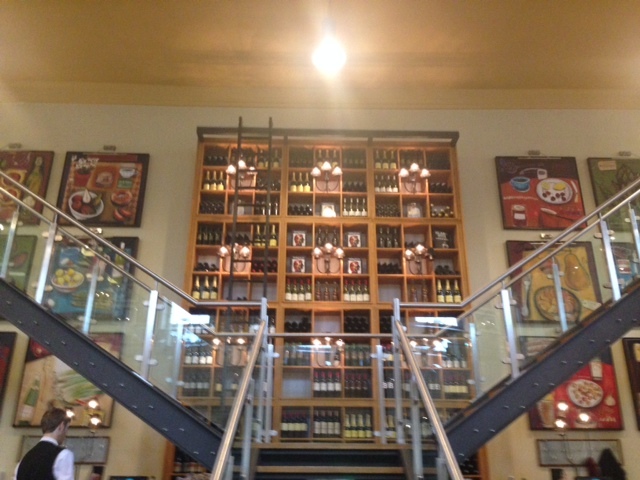 It almost feels wrong to call Brasserie Blanc a chain. Although the menu is common throughout, it changes from season to season, and part of the brand’s ethos is to choose unusual and iconic buildings, and as such, each one feels very different, with different décor and layouts. The Bristol venue is in an old Masonic meeting house, which is a beautiful high-ceilinged building with a gallery-type mezzanine that makes the building a draw in itself. Although a few cookbooks and products are on sale, there’s none of the in your face marketing that some chains suffer from (I’m looking at you, Jamie’s Italian) and the Raymond Blanc connection is made very subtly with a few photos on walls and a few references on the menu to Maman Blanc and the like. The emphasis is very much on the food, and we were pleased to discover from talking to one of our waiters on our most recent visit that Raymond does take time out of his busy schedule to visit each of his venues when he can, and is heavily involved in developing the menu. Our recent visit was on a Sunday lunchtime. There’s always a seasonal set menu running alongside the a la carte, which is generally excellent value and offers a good choice. On Sunday, this focuses more on traditional roast dinners – the set menu included sirloin of beef and rack of pork, with main courses £13.80 each and the option to add on a starter or main from a list of three of each for a couple of pounds more, but we decided to go a la carte. 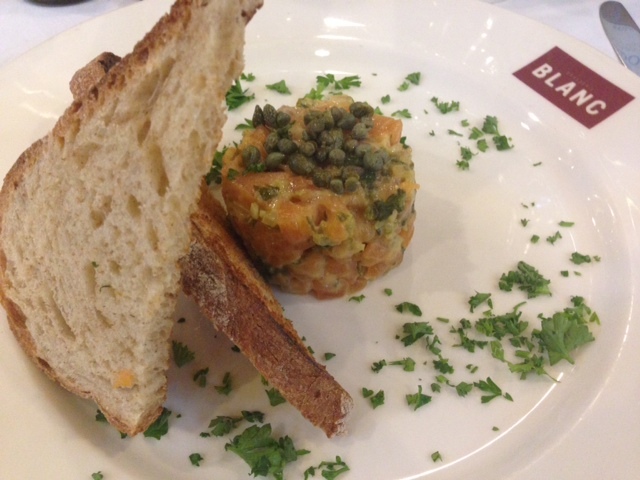 I started with salmon tartare, served with sourdough and capers. This was excellent, juicy chunks of salmon mixed with gherkins, onions and capers, bound together with egg yolk and seasoned and spiced to give it a kick which built throughout the dish. The sourdough was a suitable accompaniment although I could have done with a bit more of it and it might have benefited from some butter. 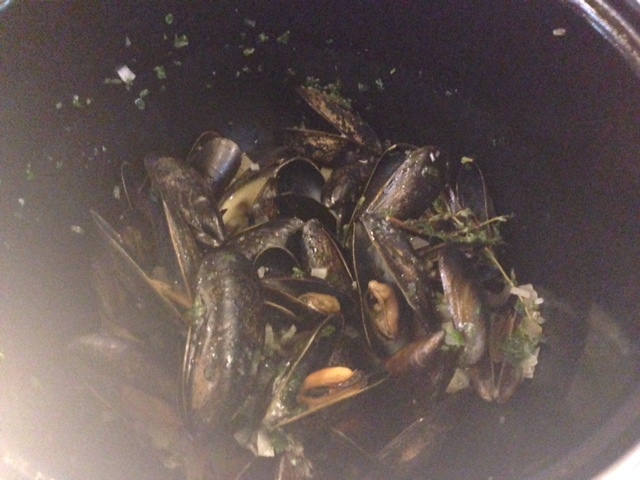 Mr W started with moules marinieres, which were served in a somewhat excessively large ‘cauldron’ which made it difficult to get into them without dunking your sleeve in the juices. What the dish lacked in practicality, however, it more than made up for in flavour. There was a notice on one of the blackboards saying that Cornish mussels were being served instead of Scottish, and it was evident from the size of the mussels that it wasn’t the best season for them, but nevertheless they were tasty, and the sauce was delicious, with just a hint of cream to balance out the white wine. 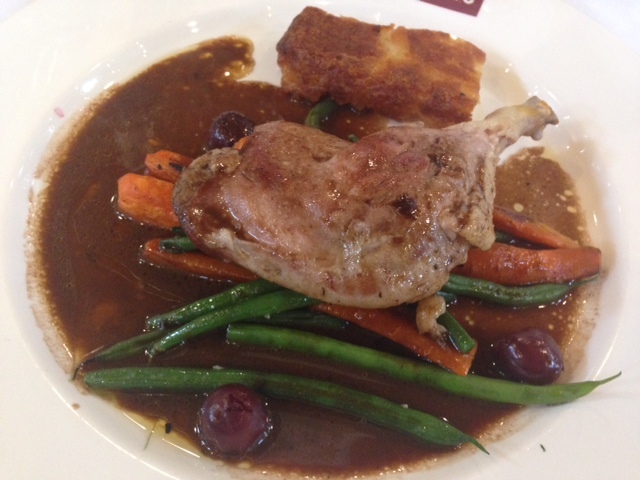 I chose a confit duck leg for my main course, served with cherry sauce and potato rosti, and accompanied with carrots and green beans. The duck was delicious, moist and juicy, and the cherry sauce was tasty. The veg were particularly well cooked, but the rosti was disappointing: not much of it, and it had a very oily taste which was verging on unpleasant. 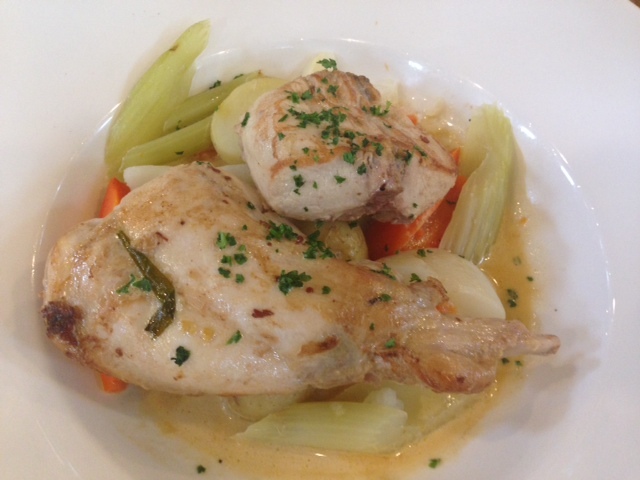 Mr W opted for rabbit served with mustard cream and braised vegetables. This dish was probably worst nightmare as I’m not keen on rabbit and one of the vegetables was celery, which I dislike intensely, so I can’t really comment objectively on it, but Mr W enjoyed it! 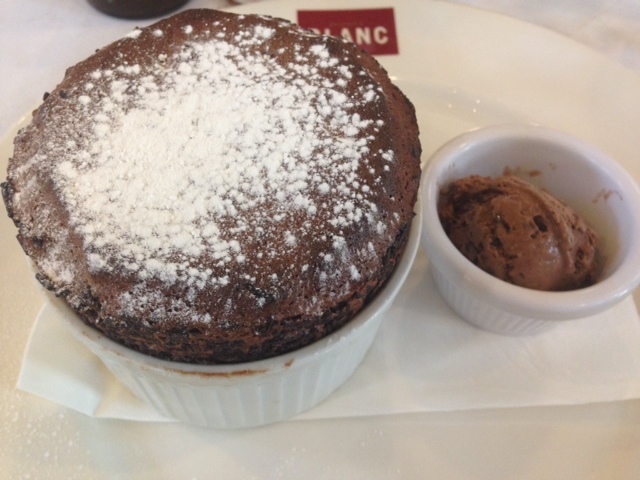 To finish, I chose a chocolate soufflé served with Valrhona chocolate ice cream. The soufflé started off really well: a crisp top which gave way to a gooey, slightly fluffy centre. At the bottom and sides, however, there was a layer of what I think was chocolate vermicelli – perhaps used to stop the soufflé from sticking to the dish – which I found very odd and a bit off putting, so I didn’t finish the dish. The chocolate ice cream was tasty, but a bit surplus to requirement, other than to cool my mouth after a slightly too hot mouthful from the gooey centre of the soufflé! I’d have preferred vanilla ice cream or perhaps some cool creme fraiche on the side instead. 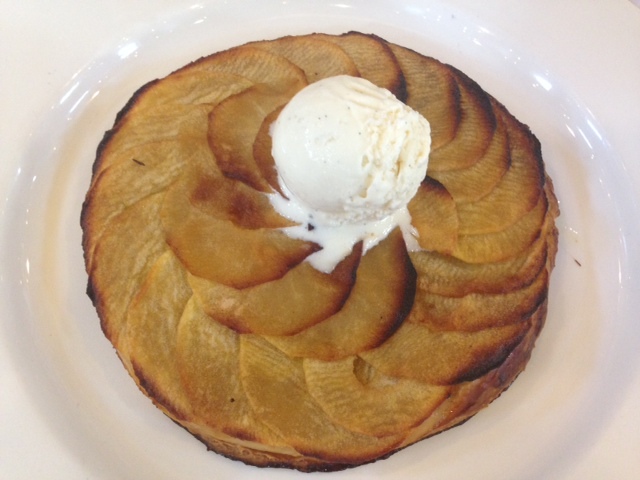 Mr W went for a fine apple tart with vanilla ice cream. This was really good: crisp pastry with sweet, caramel-infused apples with just a hint of sharpness which was tempered by the ice cream. An excellent pudding, which I ended up wishing I’d chosen. Service was fantastic throughout. The staff are knowledgeable, friendly and professional and seem to work exceptionally well as a team. 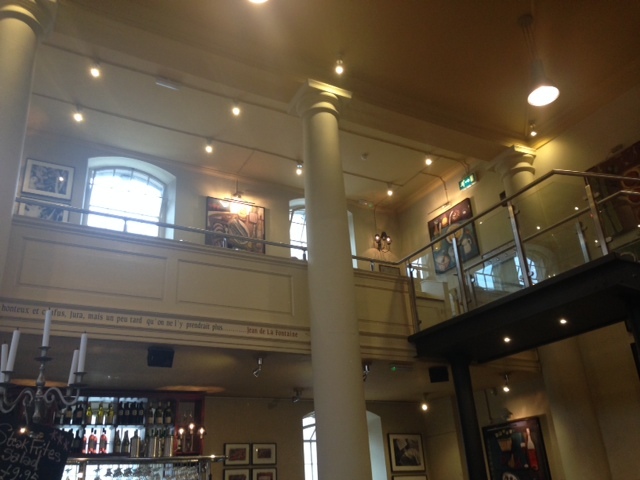 Although our meal wasn’t perfect on this occasion (we’ve definitely had better meals there), it was very good and I do enjoy going to Brasserie Blanc as you’re pretty much guaranteed a good meal. It doesn’t feel like a chain, and the Bristol one is well worth a visit just to experience the venue. It stands head and shoulders above the raft of chains that populate Cabot Circus and is good value for money. Thanks for your review. I’ve always wondered what Brasserie Blanc would be like in Bristol as I’ve eaten in Carluccios next door on a couple of occasions. I will certainly try it next time I’m in Bristol, although your meal was not perfect it does look yummy. I agree with you about the soufflé. Why put chocolate with chocolate? Vanilla ice cream would be my choice.